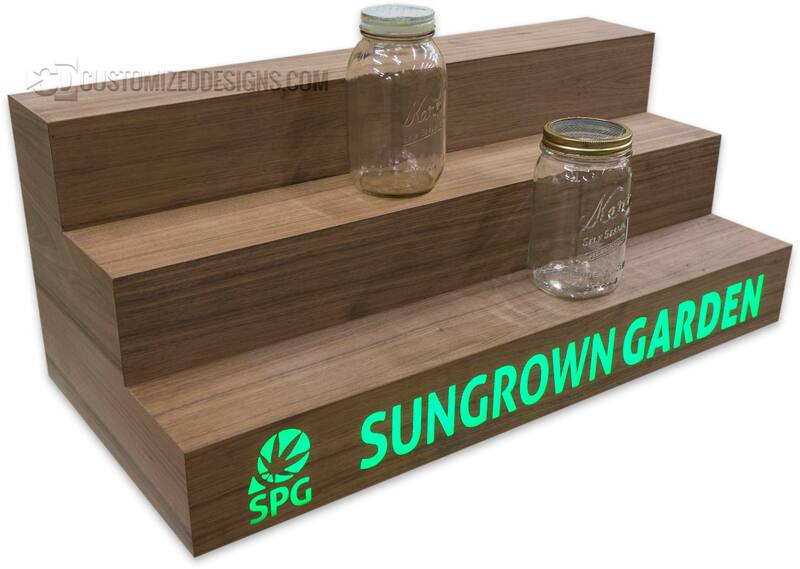 This is a custom 3 tier we made recently for a customer who plans on displaying their cannabis products on it. The display itself looks fairly standard but it was actually quite the challenge to fabricate. Seamlessly integrating the all wood design with the lighted logo in the front was the hardest part. The wood color is unfinished walnut veneer and normally we wouldn’t recommend doing something like this because staining the wood would be very difficult with the logo in the front. However, this customer plans on leaving the veneer unfinished so it worked out well. Not staining or sealing the wood veneer is also something we wouldn’t normally recommend doing since the wood can be ruined by moisture and liquor but in this case, they’re only displaying pot jars on it so that won’t be an issue.